For the first time, I returned from the lake without taking one photo. So imagine my surprise later that afternoon to find this big bird strolling by the house. 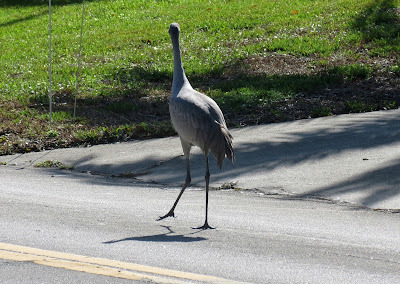 One of my favorites, a sandhill crane, I ran for my camera. What was mine had come to me, I didn't need to go out looking for it. The red coloring on their head indicate we are awakening to higher intuition and guardianship. Sandhill cranes were showing up over the weekend. The Sandhill Golf Course restaurant had reopened after a long hiatus. 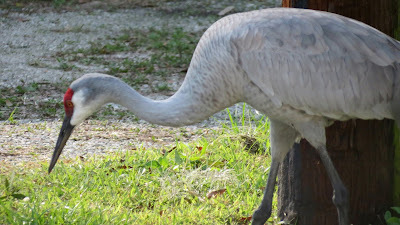 Then at a friend's lake, a pair of those stately birds made an appearance, too far away for a good photo, but I had another chance coming right by my door. Just in case I missed the Sunday message, early Monday morning, I heard their loud whooping call echoing through the neighborhood. I stood on the patio in the cold morning sunshine and listened to their celebratory song. "It is time to participate in the dance of life."